The most important thing we can do for our puppies is prepare them for their life ahead and find the best possible home for each puppy. We take raising our Greater Swiss Mountain Dog puppies very seriously and go to great lengths to make sure we do the best possible job. During the first 16 weeks of a puppy's life, his brain is rapidly growing and expanding. It's a very magical time as well as a very critical period of time in the life of a puppy. It's called the "imprint period", a time when breeders and owners can actually shape the puppy into the dog he will be for the rest of his life. Whatever a puppy experiences during this time will stay with him throughout adulthood. Likewise, whatever he doesn't experience during this time, also stays with him forever. If for example, a puppy meets many people during his first 16 weeks of life, he will willingly accept strangers when he is grown. If his exposure to people is limited, he'll be more likely to react to strangers by being timid, shy, or aggressive when he is grown. This is true for virtually everything that occurs in the life of the puppy during his first 16 weeks. Both positive and negative experiences will stay with him forever. Our goal in raising puppies is to maximize each puppy's potential by exposing them to as many positive experiences as we possibly can during the first 8 weeks when they are with us and then provide new puppy owners with the information they need to continue the process for the next 8 weeks. Maximizing a puppy's potential means giving him every opportunity to grow into the very best dog he can be. Our puppy raising program takes advantage of every opportunity to maximize a puppy's potential at each stage of his early development. Following is summary of our puppy raising process during the puppy's first 8 weeks of life. Touch: Puppies are handled multiple times a day from the day they're born. Every body part is touched and they're stroked from head to tail while they're nursing. Olfactory Stimulation: Puppies cannot hear or see when they are born, but they can smell. We stimulate their olfactory senses by introducing different smells into their whelping box for their first 2 weeks of life. Early Neurological Stimulatron (ENS): Early Neurolgical Stimulation was developed by the U.S. Military and has been proven to improve the health, trainability, performance and overall potential of puppies. It involves 5 exercises that are performed with each puppy from their 3rd through 16th day of life. Learn more about Early Neurological Stimulation. Touch De-sensitization: Touch de-sensitization begins during the 2nd week of the puppy's life. As we continue to handle each puppy several times a day, we begin to get them accustomed to different touch sensations, particulartly the type of touching that they might experience from young children. We gently tug on tiny ears, tails, legs, and feet and open little mouths. Touch de-sensitation continues for the entire time the puppies are with us. Sound De-sensitization: Although the puppy's ears are just beginning to open during the 2nd week of life, we start exposing them to all kinds of sounds at that time so that as they begin to hear muffled noises, they'll hear a variety of sounds. We create as many different sounds as we can in their whelping room and fill in the gaps of sounds that we can't create by playing soundtracks of everyday sounds that they're likely to encounter in their lifetime. As puppies get older, the volume of sounds increases. Sound de-sensitization continues for the entire time the puppies are with us, beginning in the whelping box and evenutally expanding to the outside world. Human Socialization: Socialization with people begins on day one of the puppy's life, through human touch as described above. Itexpands as the puppy gets older, and explodes from 4 weeks of age until they leave us for their new homes. Puppies are introduced and handled by an ever increasing number of people, including many young children. Our puppies meet at least 100 different people before they go to their new homes. Animal Socialization: Our puppies interact with a variety of other dogs (all dogs who we know) while they are with us: big dogs, little dogs, young dogs, and old dogs. They will meet birds and horses and if we're lucky, we'll find a kitten to play with them too. Bite Inhibition: Although perhaps a subject unto itself, we've included bite-inhibition as part of Socialization because puppies first learn bite-inhibition from their mother and from playing with their littermates. If they bite mama too hard, she promptly corrects them. If they bite littermates too hard during play, the play stops. Bite inhibition means training a puppy to use a soft mouth on people and other animals. We work with each puppy individually to help them understand that the only acceptable contact of their teeth with human skin is a soft chew, not a skin-puncturing bite. We begin the process and teach new owners how to continue it for the puppy's 2nd 8 weeks. Experiences: Enrichment experiences begin when the puppy is 3 weeks old. First, we offer enrichment experiences to the puppies while they're still confined to the whelping pen by giving them a variety of toys to play with, surfaces to stand on, and obstacles to climb over. As their play area extends beyond the whelping box, their environment changes every day: different toys, different surfaces, things to climb on, under, around and through, puppy swimming pool, puppy pool filled with balls, puppy ladders, puppy slides, puppy tunnels.... anything we can come up with to provide an ever-changing stimulating environment for the puppies to explore. As the puppy gets older, his world expands outside of his play area with daily outdoor adventures over different terrains in all kinds of weather, rides in the car, and visits to pet stores where puppies enjoy being petted by many people while they ride in the shopping basket. Potty Training: Potty training begins as soon as the puppy crawls out of the whelping pen. We use a crate pan with kitty litter in it to create a potty area for our puppies. Puppies naturally want to keep their sleeping quarters clean so we simply use their natural instincts to teach them to use the kitty litter potty area. They catch on very quickly. When they're older, we begin taking them outside to go potty and spread some kitty litter on the ground so they associate outdoors with a potty area. This does NOT mean that your puppy will be house-broken when you take him home. But your puppy will be off to a great start by already knowing that there are places to potty and places to not potty! Crate Training: We recommend that new puppy owners use crate training until their puppies are completely housebroken. We begin preparing them for this experience by getting each puppy accustomed to short periods of confinement alone in a crate. We're careful to make it a positive experience for them by providing food-stuffed chew toys that they can enjoy in their crate. When they're not in the crate, crate doors are left open, and a food-filled chew toy is tied to each crate so puppies learn to associate good things with crates. They also learn that a crate is a good place to relax and enjoy a chew toy. Bite Inhibition: Bite inhibition means teaching a puppy to use a "soft bite" on human skin. Puppies get their first lessons in bite inhibition from their mother and littermates. When they bite mama she readily scolds them. When they bite littermates too hard during play, the play stops. We re-enforce bite inhibition by letting the puppies chew on our hands and gradually accept less and less pressure from the puppy's teeth. When puppy bites too hard, puppy petting ends. Learning Basic Commands: Our goal is to have each puppy learn a few basic commands before they leave us. What they learn is not so important as that they "learn to learn" and grasp the concept that good behavior brings good things to puppies! We use clicker-training for our puppies and are happy to show new owners how to continue using the clicker for training. Leash Acclimation: Puppies will be introduced to leashes and learn that it's okay to have a strange device around their neck and walk next to people. When you take your puppy home, the fun begins and the clock is ticking! There are 8 more weeks of the puppy's imprint period. You need to be prepared to pick up where we left off by continuing socialization and enrichment for your puppy and continue bite inhibition training. Housetraining needs to begin as soon as your puppy is in your home. Continue Socialization: Socialization doesn't just happen; you need to have a plan. Your puppy will have met at least 100 people before you took him home. Set a goal for him to meet another 100 people before he's 16 weeks old and have a plan in place to make it happen. Use the e-book "97 Ways to Create Great Puppies" for other ideas. Continue Puppy Enrichment: Enrichment means new experiences, new places, sights, sounds, smell, surfaces. Plan stimulating experiences for your puppy. Expose him to different surfaces at different places, inside and outside, in all kinds of weather. Expose him to different sounds: drop pans on the floor, vacuum around him, take him to a busy street for traffic sounds, clap for him, have children shriek, play a musical instrument, give him a musical toy and a squeaker toy, let him hear the pop of a gun, take him outside in a thunderstorm.... expose him to every sound you can think of. Rotate his toys so he always thinks he has something new. Give him things to climb over, under, around and through. Use the e-book "97 Ways to Create Great Puppies" for more ideas. Continue Puppy Training: At this age, puppies are like little sponges and they learn very quickly. Keep training sessions short, 5-10 minutes, but give the puppy multiple training sessions every day. Teach your puppy different commands and little tricks. Teach your puppy to walk nicely on a leash. Continue to teach your puppy bite inhibition. Housetraining: Housetraining needs to begin as soon as your puppy walks through the door. 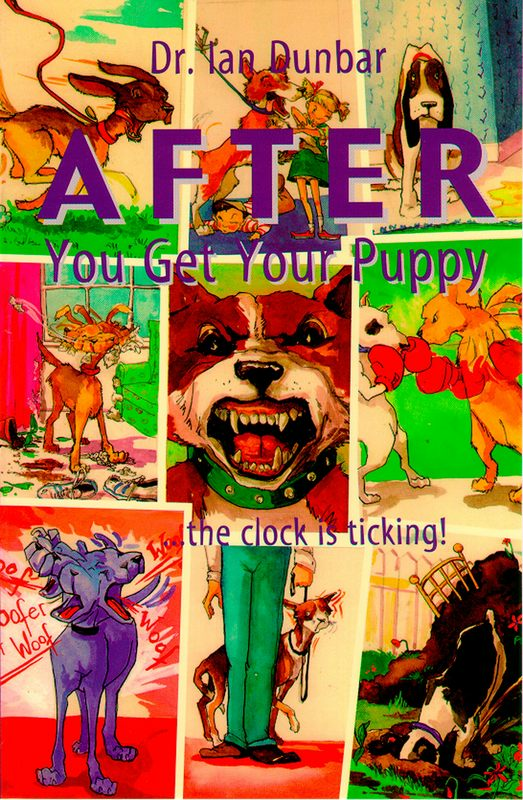 Follow the housetraining guide contained in the E-Book "After You Get Your Puppy" by Dr. Ian Dunbar. We're Here to Help! We encourage you to call on us at any time if you have questions or need help with your puppy. This book has lots of good ideas for puppy socialization and enrichment. This e-book contains important developmental milestones and a guide for teaching bite inhibition and housetraining. We take puppy raising VERY SERIOUSLY!